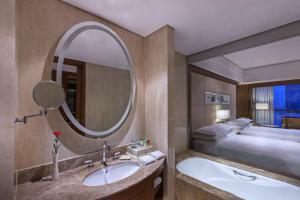 Beside Dushu Lake, the Four Points by Sheraton Suzhou offers 3 dining options and accommodation featuring signature Four Points by Sheraton Four Comfort Beds. 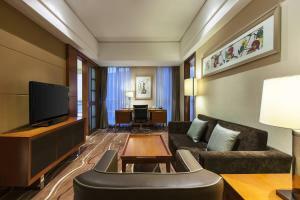 Four Points by Sheraton is located in China-Singapore Suzhou Industrial Park and 1 km from Suzhou University. Suzhou Railway Station can be reached in 37 minutes by car. Suzhou North Railway Station is a 41-minute drive away. Featuring modern décor, the elegant guestrooms are equipped with a 40-inch flat-screen satellite TV, cosy seating area and modern work desk. En suite bathrooms come with a shower and bathtub. Guests can take a dip in the indoor pool, indulge in a spa treatment, or stay fit with a workout in the fitness centre. Staff can assist with car rental, ticketing arrangement and luggage storage services. Chinese Spice serves a variety of Cantonese dishes and local delicacies. The Eatery features an international buffet, open kitchen, and à la carte menu. Alternatively, guests can enjoy refreshing beverages at the lobby lounge. This twin room has a seating area, dining area and sofa. This double room features a electric kettle, view and minibar. This double room has a dining area, bathrobe and tile/marble floor. This double room features a dining area, bathrobe and hot tub. This double room has a iPod dock, dining area and executive lounge access. This double room features a iPod dock, sofa and bathrobe. This twin room has a dining area, soundproofing and sofa. 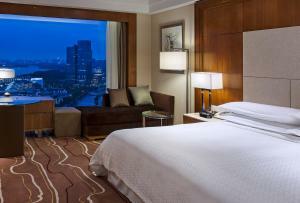 Rate: CNY 443.00 ... CNY 1175.00; select dates below to get current rates.